Frugal Fun and Fortune: $1/1 Rayovac Coupon! It's true: you can save money and have fun doing it! This is a GREAT coupon. 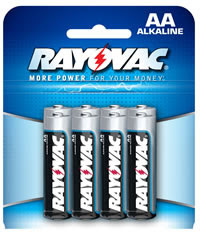 Go become a fan of Rayovac on Facebook, and you'll receive a $1/1 coupon! Target often has these batteries in the Dollar Spot up front, which means FREE batteries with the coupon! Woo Hoo! What About You: Ever tried these batteries? I have! They don't last as long as some, but hey...FREE batteries? I'll take it! that you update this once more very soon. concept to talk about with my friends and classmates. appears to be building inside this particular area, all your opinions tend to be relatively stimulating. reality you are generally yourself not even entirely convinced of your argument. can repair in case you werent too busy on the lookout for attention. It’s actually a cool and helpful piece of info. I am satisfied that you shared this useful info with us. the nice info you've gotten here on this post. I will probably be coming again to your weblog for extra soon. teaching most people all through your site. on issue and not embark upon a soap box involving the news du jour. I am always browsing online for tips that can aid me. individuals on this topic, however you sound like you know what you’re talking about! you're a great author.I will always bookmark your blog and will often come back at some point. I want to encourage you to continue your great posts, have a nice morning! involved unless it is one thing to accomplish with Girl gaga! Your personal stuffs outstanding. All the time take care of it up! my site something like that. Can I implement a part of your post to my blog? link to the perform concept of what i am carrying out. Bill, I thought this was going to become a good study. That is, till I received for the "Who would you add" subject. You audio bitter! Chatting having a person for 20 minutes doesn't equate to understanding them so why Must they desire to add you to their facebook page? Seems to me like you happen to be the one using the hang-ups! on jacked. The itchyness and redness was also a lot to deal with so I didnt even finish it off. with model appears, but these very same girls are with guys that are not italian. at models/skinny girls, and it makes me query whether my bodily look is suitable or not. So my query is are guys of other ethnicities significantly less fascinating? can it be a fantasy of each lady to be by having an italian dude? It's hard to find experienced people in this particular topic, however, you seem like you know what you're talking about! read articles, however this website presents feature based posts. your nostrals soon after flushing to keep them moist. And I use coconut oil being a face moisturizer given that I went all natural-thanks to Gill Deacon's book There is Lead in Your Lipstick. it give the impression like a few of the remarks look like coming from brain dead folks? tags without feeling any pain and they'll be quickly eliminated. Click OK and wait a second or two for the effect to be applied. people excited about everything've written. Just my opinion, it would make your blog a little bit more interesting. workout submit) So far, I'm genuinely making the most of the lifting, as I had been getting sick and tired of my modified Body By Science routine and my gains there had been slowing way down. Deadlift exercise tonight, and I am seeking forward to it! this concept functions ideal for me. Hi everyone! I'm Meg! I hope this blog blesses you! I am a daughter of God, recent postgrad, a newlywed to a wonderful husband, and a seeker of simplicity in life. My greatest passions are: Jesus, loving others, social justice, ending poverty, simplicity, family, music, and outdoor adventure. I also enjoy reading, knitting, scrapbooking, bargain hunting (of course! ), cooking, baking, and playing piano. After a few unexpected events, my husband and I found ourselves barely able to scrape by every month. We are still in that situation, but couponing and bargain hunting have helped us not only survive, but THRIVE, on very little! My hope in making this blog is that I can encourage you, help you through your financial battles, help you learn how to save money, save you time in the process, enable you to give more away to others, and show you how much fun it can truly be! If you ever have any questions, suggestions, ideas, or info on deals, feel free to contact me. My e-mail is frugalfunfortune@gmail.com! I am also very PR friendly, so feel free to e-mail me about advertising or giveaways on this blog. Thanks for visiting. Enjoy! Johnson's Cotton Swabs for $.38! Quick Giveaway -- Five $1/1 Pepsi 20oz Coupons! *HOT* Coupon for a Free Bag of Snikiddy Snacks! Check Your Kraft First Taste Account!